Taste test: This is a Hershey's bar (one long rectangle with 12 little rectangles that you can break off if you want) made of white chocolate and flecks of raspberries. I was expecting a white bar with red dots, similar to the style in the Hershey Cookies 'n' Creme bar, but was surprised to find that the chocolate bar was slightly pink instead. If you like white chocolate, you won't be disappointed. The white chocolate taste comes around first, and a hint of raspberry emerges afterward. It reminded me of eating a bowl of raspberries and cream, albeit with a chocolate bar. Smell test: Smells somewhat like raspberries. 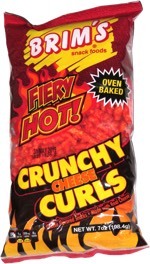 This snack was discovered by Keith at Store 24. Review published .